Help Teach An Adult to Read. Become a Volunteer Literacy Tutor. (SAPULPA, OK – January 19, 2016) The statistics are shocking. Seventeen percent of adults in Creek County 18 to 24 years old do not have a high school diploma. Eleven percent of adults in Creek County 25 years of age and older do not have a high school diploma. Twelve percent of Oklahoma adults – more than 400,000 – are functionally illiterate. 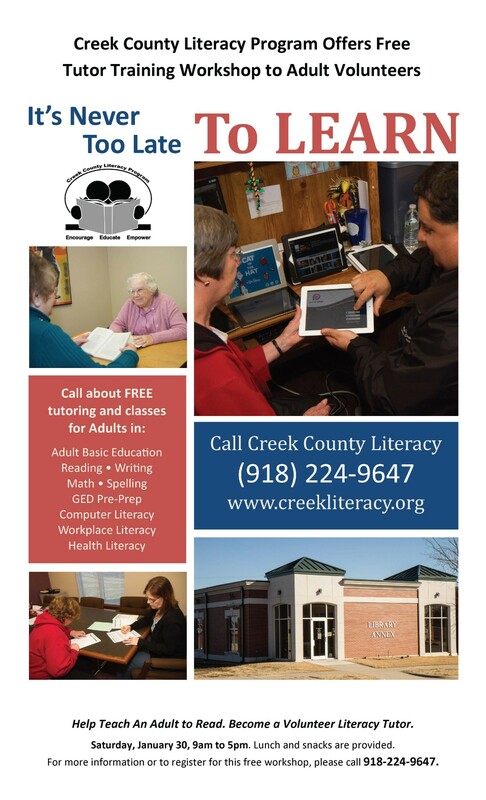 Creek County Literacy Program is seeking volunteers to tutor adults in basic literacy. Creek County Literacy Program is a non-profit organization that trains adults to become volunteer literacy tutors, and then matches those tutors with adult learners. To become a tutor, one must attend CCLP’s free 8-hour Tutor Training workshop. Knowledge of another language is not necessary and no prior teaching experience is required. This free workshop is held at the Library Annex, 15 North Poplar Street in Sapulpa. The workshop is Saturday, January 30, 9am to 5pm. Lunch and snacks are provided. The presenter, Donna Hall, received her Master’s in Reading from Northeastern State University. Hall is a Certified Reading Specialist as well as a National Board certified teacher in Early Childhood Education. She has taught in the elementary school setting for nearly 20 years, teaching second grade at Edison Elementary School in Bristow. For two years Hall served as a REAC3H Instructional Coach, providing training and assistance to 14 school districts. She has also completed the requirements to present innovative strategies for Oklahoma literacy instruction as an Open Minds trainer, sponsored by the Literacy Resource Office of Oklahoma Department of Libraries. For more information or to register for this free workshop, please call 918-224-9647. 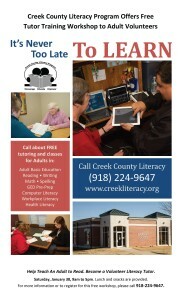 Creek County Literacy Program’s primary emphasis is youth and adult literacy. Struggling first and second grade readers tutor one-on-one with senior citizen volunteers weekly through the Caring Grands Reading Program. Last year, CCLP educated more than 2,400 adults and distributed more than 3,000 free children’s books. This entry was posted	on Tuesday, January 19th, 2016 at 3:37 pm	and is filed under News. You can follow any responses to this entry through the RSS 2.0 feed. Both comments and pings are currently closed.